Pittsfield once had its own brewery, and quite a well-known and lucrative one at that. It was established in 1868 by German immigrants Jacob Gimlich and John White, both of whom were Civil War veterans. Gimlich started out working for Taconic Woolen Mill, but soon joined his brother-in-law White to buy out a small brewery in town. 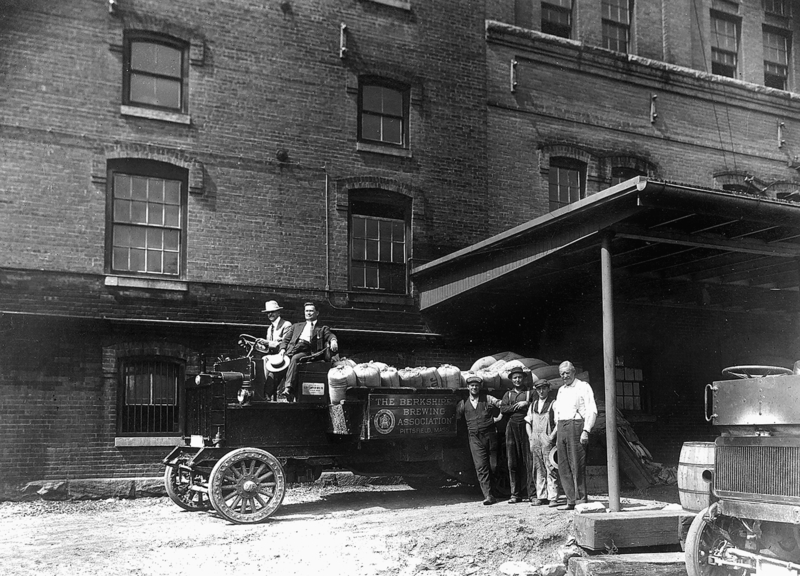 The two launched the Pittsfield Brewery in a small plant at the corner of Columbus Avenue and John Street, where they produced initially about 6 barrels a day. Their business grew fast, as the only brewery within 50 miles of the town, employing by 1890 one hundred people and producing 300 barrels a day. Their line-up of beers sound like the finest craft beers of today – Lenox Half Stock Ale, Greylock Ale, Mannheimer Lager and India Pale Ale. They soon outgrew their small plant, and built a larger building in 1890, but not far up Columbus Avenue at the corner of Onota Street. Occupying an entire city block, the imposing brick factory measured eighty by forty feet and stood five stories tall. Old maps also indicate that they were able to re-route water under Onota Street to their factory for their brewing purposes. The brothers lived across the street in large houses. Shortly after building this new brewery, the two founders turned the business over to the next generation who continued to expand. Sales of Berkshire beer reached across New England and as far south as the Carolinas. Prohibition, passed in 1919, forced the brewery out of business. Many of the buildings on the brewing complex were torn down, but the Siegel Furniture Company bought the bottling plant and converted it into warehouse and showroom space. The city purchased the site in 1975, perhaps as part of its ongoing, but controversial, urban renewal programs that razed buildings along Columbus Avenue closer to North Street. The housing authority had built the complex of apartment units which currently occupy the block.